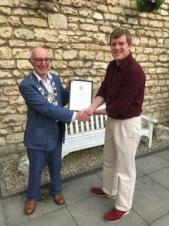 The Leslie D Gale Award was instituted in 1994, as a tribute to the late Mr Gale, who was the last Chairman of Dursley Parish Council and the first Mayor of Dursley, and who served the community in so many ways. The Leslie D Gale Award not only recognises longevity of service to the community but also impact. Dursley Town Council is very aware that young people also contribute to the community, and that their work should be recognised. Nominations do not have to be for individuals; in past years groups have also been successfully nominated. The recipients of the 2018 awards were announced at the town's Annual Assembly on the 22nd May 2018 by the Town Mayor. The recipients are Cllr Jane Ball, Linda & Chris Cherry and Tom Arnold who received their awards on the night. Ms Kate Reynolds was announced at the Annual Assembly as the 2018 recipient of the Unsung Hero award. The Leslie Gale Award recognises not only the longevity of service to the community but also its impact. This person perfectly fits both criteria and it could be argued that maybe the award to her is long overdue. This is a brief resume of some of her achievements over the years. When her children were small she became a Governor of Everlands School and was Chair of Governors for 12 years. In 1999 she became a member of Dursley Town Council and in 2005 she was elected as Mayor, a post she held for ten years. She is currently the longest serving Town Councillor. 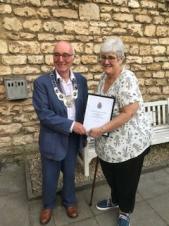 Her commitment to the role both as Town Councillor and Mayor of Dursley has never wavered, she has represented the town on many occasions and is always knowledgeable and interested in the welfare of Dursley and its inhabitants. She has other interests outside of the Town Council and is currently the Chair of the Dursley & Cam Branch of the Royal British Legion. When the Vale Community Hospital formed a League of Friends in 2011 she joined the committee and has, for some years, been the Chair of this committee too. Apart from all of this, she still runs the Dursley Community Centre along with her husband. She is a serious quizzer, both taking part in the local league as well as writing questions for charity quizzes, which have raised large sums of money over the years. How she does all thus, I do not know. I am sure by now, everyone in the room will be aware of the lady in question. The last year has been difficult as she has had some serious health issues but, whenever possible, she has still carried out her duties with her usual efficiency and cheerfulness. I sure that everyone here wishes her a speedy recovery. So, it gives me enormous pleasure to present this award to Jane Ball. I (Mayor Grecian) first got to know Chris and Linda, when I was appointed town council representative on the Dursley welcomes walkers steering group in 2012. I was aware that they have been involved in the town for many years with Vale Vision and the various projects it has been instrumental in: The Sculpture trail, the Health walks and Breakheart Quarry. However, it is on the Dursley Welcomes walkers Steering Group that I can say the most. Chris has been Chairman and Linda the publicity officer since its inception in 2011. This year will mark the 8th Festival in October, which will be the biggest ever. The Festival has helped to put Dursley more firmly on the map. None of this would have been possible without their energy and enthusiasm for walking and Dursley. They have been instrumental in involving the local traders regularly attending their meetings, linking to local rambling groups and societies and sorting out sponsorship from local businesses. Recently they spearheaded our links to the Cotswold AONB hub towns project for walking and cycling. This was achieved, and the area will see new signage and hopefully more visitors. All groups involve lots of people working together, but it is without doubt Chris and Linda who have led by example, spending many hours coordinating other efforts and inspiring others to do more. It is with pleasure that I present the Leslie Gale Award to them for services to Dursley. Tom has been a stellar resident since moving to Dursley a few years ago. Last year he joined the committee for Festive Dursley committee, using his ex-cameraman skills and contacts to be a proactive and helpful volunteer. He has been the figurehead behind many fundraising projects for the event, including a pop-up shop this year, collecting donated books, CDs, DVDs and Games to sell to raise funds and soon he is to start a crowdfunding project to raise even more money for the Christmas lights. He aided Cllr Suzi Abraham in their efforts to raise money for the charity; SENSE by putting aside his time to help organise and rehearse their popular Grease Night. He also volunteered for Dursley Carnival; last year, spending the day setting up, long after others had gone home, and again the actual day of the Carnival simultaneously volunteering with organisation and security. In the snow storms this year, he took it upon himself to clear snow on the paths and road along the whole of Parsonage Street, Silver Street and Long Street, spending hours making it safer for others to walk in the bad weather. Last weekend with Tom was instrumental in Dursley hosting the first street party since the 1997 Jubilee to commemorate the wedding of Prince Harry and Megan Markle. This proved to be a very successful event with many people commenting what a wonderful atmosphere was created in the town centre. He continues to be a lively, dedicated and friendly resident of this town, despite not being native to the area. It is with pleasure that I present the Leslie Gale Award to Tom for his services to Dursley. The full list of previous recipients of the Leslie D Gale award since 1994. HTML5 validated. WCAG compliant. Page generated in 0.0655 seconds.